World War II American PT boat. This is my first scratch built model, retired last year so I have some time on my hands! 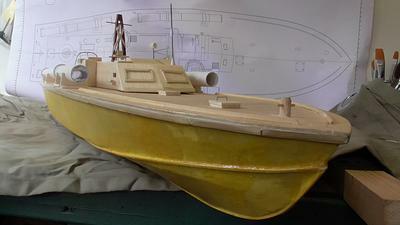 It is 1:32 scale built from the excellent plans supplied by Petter. 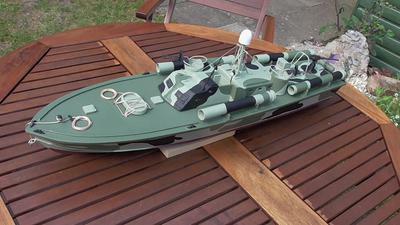 It's not a PT109 as I prefer the mast and radar on the later boats. 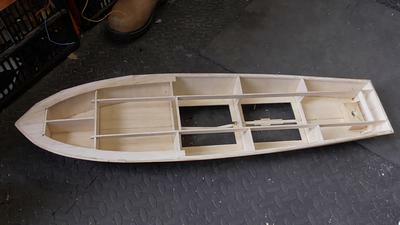 After printing the plans and cutting out the templates I spray glued the templates onto balsa and cut out the components (with a scalpel) I was very careful with the cutting out and this payed dividends as the parts went together like a dream! Researched on the internet for any details not on the plans. Also obtained a copy of an excellent book by Victor Chun called American PT Boats in World War II, loads of information in that. Did a camo paint job based on the information in Chun's book then sprayed with a couple of coats of matt lacquer. Fitted the 540 motor suggested by Petter, goes like a rocket!! Gets up and planes really well. Really enjoyed the build and Petter's plans and build information on his website was a massive help. Comments for World War II American PT boat. Almost speechless at the apparent quality of the build. A family heirloom for sure. Great job Mike, and thanks fort the kudos!